We will be closed for the Labor Day Holiday, September 1-3, 2018. Larry Evans started the business in 1956. Larry’s wife, Diana and several of the nine children have continued running the business.The business was built on Honesty and earning the Trust of our customers by Listening to fulfilling our customer’s needs,which has kept our customers coming back again and again. Then, This IS the Place for You! Most of Our products are sold less expensively for many reasons! We purchase and utilize the best quality, sizes and useable pieces. We buy seconds with minor flaws(example: the color of the roll may not match the color sample shown in a sample book). 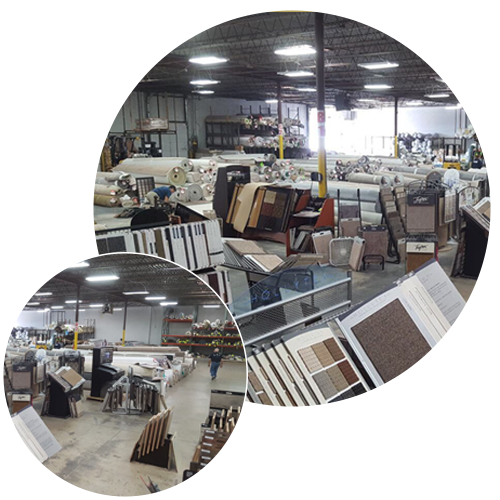 Plus, We have over 60 years of purchasing longevity and relationships with the Top Name Brand Carpet Mills in the U.S.! area rugs, hall and stair runners. Convention Exhibitors, Fairs and Trade Shows. making it easier to make the right choice! So, you are assured of our detailed personal service! Customers and Friends back repeatedly! We Only Work with the Very Best! A. Yes, we sell to the public! That includes YOU,Contractors and other Carpet Companies. Q. Do I have to buy a certain amount? Q. What if I don’t know how much I need? A. We will measure your areas by appointment for a charge and credit that charge back toward your purchase. Q. Do You install the carpet? A. Yes, with certified installers. Q. Will You Bind my own carpet? A. Yes. You can bring your own or buy from us. Q. Do you do special orders if I don’t find what I want ? Q. Do you make area rugs? A. Yes, they do binding and will customize the rug to your size. 30,000 Sq. Ft. of Carpet Bargains! Come, Make Your Selection Today! Evans Carpet Junkyard, Inc., 655 N. Hague Ave. Columbus, OH 43204.